stretch the core ranges of the golf swing. Most golf stretch DVD's are a mish-mash of yoga stretches (5,000 year-old stretches) and conventional fitness stretches (100 year-old stretches). Most of the stretches, frankly, have nothing to do with the golf swing (yogi's played golf 5,000 years ago? India is a great golfing nation?). The Somax golf stretch DVD—Are You Flexible Enough for Golf?— is the first and only golf stretch DVD that shows you how to measure your flexibility—and then successfully stretch the core ranges you need for an effortless, efficient swing. What are the advantages of measuring your flexibility? First of all, if you don't measure, you are likely to stretch areas that are already flexible, and ignore those that are really tight. Why? Because stretching muscles that are somewhat less tight feels comfortable, and stretching areas that are really tight is uncomfortable. But if you don't work on the areas that are really tight, you are only making your body more out of balance than it already is. 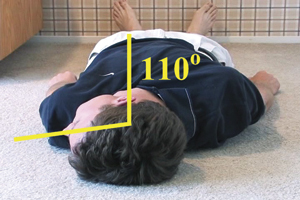 Secondly, when you measure, you can determine how much progress you are making with your stretches. Are you really getting more flexible? Measurably flexible? Or do you just feel more comfortable? As we said, most golf stretch DVD's throw a bunch of stretches together and call it a system. But if it is a system, where are the measurements? In our golf stretch DVD, we show you the core ranges of the golf swing, and why you need these core ranges more than any other. You need a minimum of 90° of Arm Flexion to get your left arm up at the top of your backswing. Getting your arm up at the top of your backswing is the easiest way to add effortless distance to your swing. One pro who improved his Arm Flexion with us increased his longest drive on tour from 295 to 400. You need a minimum of 110° of Neck Rotation in order to look back over your shoulder at the top of your backswing. If your neck is stiff, you can't look back over your shoulder and the bridge of your nose will cover up your right eye. This means you lose stereoscopic vision. When you can't see the ball clearly, you will tend to mishit it. What do golfers do when their neck is stiff? They either spray their drives, or they shorten their backswing to keep eye contact with both eyes—and hit shorter drives. 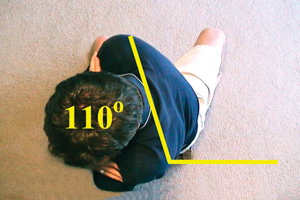 You also need a minimum of 110° of neck rotation for putting. One pro who came to us with a stiff neck improved his putting on tour from #113 to #1 after we increased his neck rotation from 45 to 110°. If your neck is stiff, your head will move as you rotate your shoulders during the putt. This small amount of head movement will force you to mishit the ball, and miss your putt. The easiest way to improve your putting is to improve your neck rotation. At our clinic in Tiburon, CA, we have all our golfers do 20-foot carpet putts (equivalent to a 60-foot putt) before starting their program. Nearly all of our clients are single-digit players. But they only make 1 out of 4 putts at this distance before we improve their neck flexibility. After we release microfibers that are restricting their neck, they make 4 out of 4, 8 out of 8 and some have even made 12 out of 12. Trunk rotation is the key to distance on the swing. You need a minimum of 110° of Trunk Rotation in order to turn your shoulders enough to generate effortless club head speed. Trunk Rotation is the range that will increase your Y-factor, the differential in turn between your shoulders and hips. Most teachers try to increase the Y-factor by restricting your hip turn. But this is just like putting a restrictor plate on the carburetor of a racecar. Instead, increase your Trunk Rotation to a minimum of 110° and you will be able to hit effortless, long drives. The hips are the engine of the swing. You need a minimum of 60° of Internal Hip Rotation in order to turn your hips 60° away from the ball at the top of your backswing. This is what all the great golfers in history did before the current epidemic of hip restriction infected golf instruction. The result of this epidemic is that more and more young players are getting back problems. Once you can achieve the minimum range of each of these four core ranges, you can hit awesome drives. One of our golfers increased his average drive from 290 to 350 after we improved his Arm Flexion, Neck Rotation, Trunk Rotation and Internal Hip Rotation. His average was 350. We saw him hit 375 on a par 4. Most of our golfers have been told by a teacher or trainer that they have 'average' or 'better than average' flexibility for their age. When they come to us and we measure their flexibility and then show them the flexibility of historically great golfers, they are appalled. The complain bitterly that no one told them how bad off they were. They are even more angry when they find that most of their problems in golf are the result of their 'average' or 'better than average' flexibility—and not 'lack of concentration'. You see, the thing that teachers and trainers don't tell you is that the golf swing requires more flexibility than any other sport-except swimming breastroke (breastrokers need a minimum of 80° of internal hip rotation, golfers need only 60). Since teachers and trainers see so many stiff golfers, they set their sights too low. They also know, with the stretches currently available, that little or no progress is made in improving flexibility in their golfers. Since they can't do much about the flexibility of their clients, they just say 'You're average'. If you want to be average, then you will shoot over 100, have a yearly income of $39,403, get a sore or stiff back after you play, and have poor flexibility—that's average. Is this what you want out of life? Is this what you want out of golf? DVD’s ordered Sun-Thurs ship the next day. Orders Fri-Sat ship the following Monday. All domestic orders shipped by Priority Mail with tracking. All international orders shipped by International Priority Mail with tracking within US. A tracking email will be sent to you when it ships. Delivery is five business days or less in US, but may be up to two weeks internationally, depending on your local postal system. 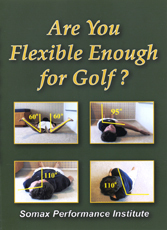 Most golf stretch DVD's show you stretches to improve your flexibility. We show you stretches to improve your performance. Stretches to improve your flexibility are just that—stretches to improve your flexibility. Stretches to improve your performance are based on the biomechanics of the swing—not on some 5,000 year-old system designed to help people meditate. As we said before, if yoga was good for golf, then India would be the greatest golf nation in the world. Indian players would be on the leaderboads of all the tournaments played around the world. After all, they have been doing yoga for 5,000 years. By carefully measuring the ranges that historically great golfers went through during their swing, and then carefully duplicating those ranges in our golfers, they went on to win the US Open as a rookie, quadruple their tour income, improve their putting from #113 to #1, and increase their longest drive from 295 to 400. Our recreational golfers have added up to 60 yards to their average drive and cut 5-11 strokes off their handicap. Not to mention that they got rid of chronic hip and back pain. One of our client's back pain was so bad that he had to stop playing for two years before he saw us. After we improve his core ranges, he went to Florida and played two rounds a day for four days (against our advice) with no pain at all. Another golfer had to take four 200mg tablets of ibuprofen every four hours before and during a round just to be able to play. After we improved his core ranges, he was able to leave the pills at home. Since not all golfers have the same flexibility, we include specific stretches for different flexibility levels. 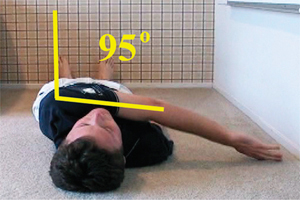 We know, for instance, that if you have 30° or less of Internal Hip Rotation, you won't be able to do the Z-stretch. So we show you a stretch that you can do. As your flexibility improves, you can then graduate to the Z-stretch. The same with your arms, neck and trunk. One size does not fit all, which is why we show you how to use your home camcorder or digital camera to record your range. We also include a transparent protractor so that you can measure your ranges. Once you know how many degrees you have on the right and left sides, you will know which stretches to do. To help you keep track, we include a record book to write down your ranges. As you do your stretches you can keep track of your progress from week to week. "Feel is not real in the golf swing"
As one of our golfers said 'Feel is not real'. Our golfers are constantly surprised to find that they are very stiff in one range, but loose in others. They never 'felt' the stiffness in this range. The reason is that when something in your body is always the same, you don't notice it. Your brain is wired to notice changes. So, if you are stiffer in your left hip that your right, you will probably notice the stiffness in your right hip, it may even be sore from time to time, but the left hip, which is totally locked up, will feel 'normal'. The only way you will know is to measure. Everything that is important in life is based on measurement. Medicine, engineering, architecture, economics, construction, manufacturing, investments—all are based on metrics. We don't say 'I felt like I took 3 strokes on that last hole', we count the number of strokes. Your doctor doesn't look at you and say 'I feel like your cholesterol is high; I'm getting high cholesterol vibes from you. ', he orders a test and then gives you the numbers. Doesn't your flexibility deserve the same precision as the rest of your game and your daily life? Why continue to be in the dark about your flexibility? Why bother to stretch without measuring? Try our golf stretch DVD for 30 days. Videotape or photograph your ranges. Measure your ranges. Do the stretches. Photograph and remeasure once a week for four weeks. If you don't measure an improvement in your ranges, and don't see a measurable improvement in your game, send us your photos and measurements with the DVD for a full refund (less S&H). We have been in business for forty years. Our Olympic athletes (who all measurably improved the ranges for their sport with our program) have won 44 Gold Medals and have set 11 World Records. We have written for Golf Magazine, The New York Times, The Runner, Swim and numerous other periodicals. Our discoveries in sports mechanics have been presented in scientific conferences and coaches meetings from Europe to Australia. Clients come to us from Singapore, South Africa, Germany, Latin America, and all over the US and Canada to improve their performance by improving the ranges needed for their sport. Each one of the stretches in this video is a total of 12 minutes. If you don't have the self-discipline and resolve to devote at least this amount of time every day to measurably improving your flexibility and golf game, don't order this video. If your M.O. is to look and something and put it on the shelf, don't order this video. If you are easily discouraged when you don't get instant results, don't order this video. If you are happy with your flexibility and your handicap, don't order this video. But if you want to change your body and change your game, and you have the will to do something about it, then this is the golf stretch DVD for you. If you have ordered other golf stretch DVD's and found they just don't deliver, even though you did all the stretches they recommended, then this is the golf stretch DVD for you. The only golf stretch DVD that shows you how to measure and stretch the core ranges of the golf swing.